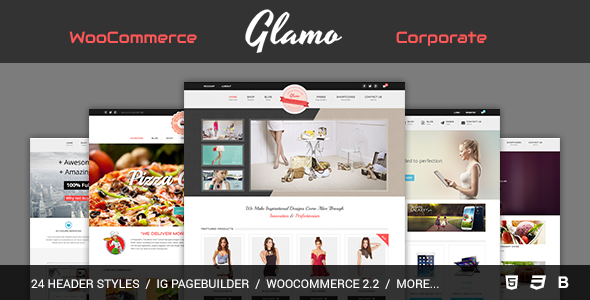 Glamo is a responsive WordPress eCommerce theme built on the top of very popular plugin – WooCommerce. The advantages of Glamo are perfect integration with WooCommerce and a lot of powerful and easy-to-use options which help you to present products in order to sell them finally. Using Glamo, you do not have worry about website customization because you already has a powerful theme options page that can help you to adjust almost everything you need for an eCommerce WordPress website or for a business / corporation website, such as: 24 header styles, mini shopping cart, custom widgets, unlimited color schemes, menu icon, etc. Latest Tweets: display latest tweets from a twitter account. Compatible with latest Twitter API. Recent Posts: display recent posts from your blog with many options to show/hide thumbnail, post date, comments, excerpt. Tabs: display recent posts and recent comments in a beautiful tab widget. Item Reviewed: Glamo Responsive WordPress eCommerce Theme 9 out of 10 based on 10 ratings. 9 user reviews.